This brown rice bowl is exactly the meal we want to eat when we've overdone it on the weekend and need to hit the restart button on our diet. It's an easy, healthy recipe that tastes fresh and is completely satisfying. Probably because it's got a variety of textures and flavors so our palate is never bored. 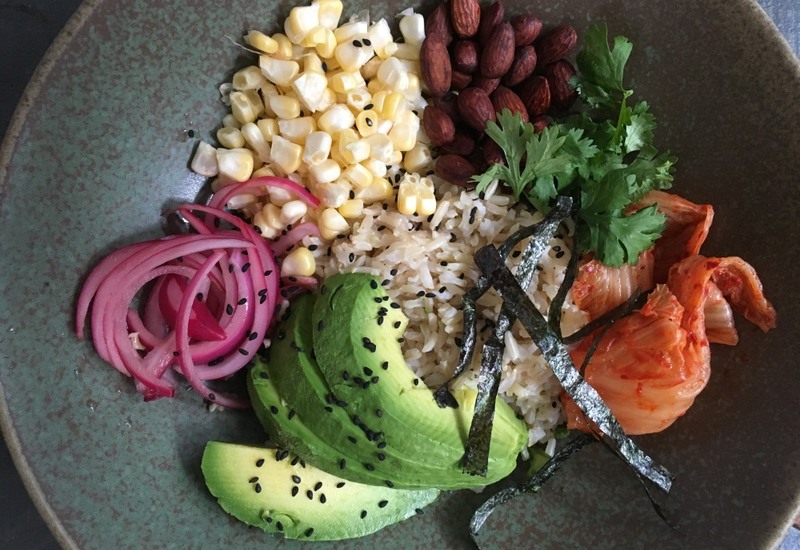 There's nutty, chewy brown rice; creamy, rich avocados; crunchy almonds; and tangy, spicy kimchi. At the end, you drizzle the bowl with an earthy, lemony tahini dressing. With such craveable flavors, eating healthy has never taseted so good. Make the bowl your own by adding your favorite ingredients. You can go with greens like arugula or watercress. Looking to up the protein? Try adding roasted salmon or chicken. Or keep it vegetarian with seared tofu. Quick-pickled red onions are a great fridge staple as they only need about 15 minutes to prepare and will last about a week. Make these the night before or right when you start cooking. To save time, you can grate the garlic with a Microplane instead of mincing it. Per Serving: 699 calories; 48g fat; 55.1g carbohydrates; 19g protein; 0mg cholesterol; 480mg sodium. I learned a lot from cooking this recipe. I had no idea you cook quick-pickle veggies so fast. Delicious dish, I will definitely make again. Such a great easy weekday lunch or dinner. I actually made this for dinner, then packed the leftovers with some leftover chicken from the night before for lunch the next day. This is a great formula for making grain bowls from ingredients you might have laying around your fridge. And the pickled red onions are addictive!